Noëlla Coursaris Musunka is talking about her earliest memory. “It’s a blank before the day I went to wake my father from his nap, but he wouldn’t wake up. I remember him in the bed, that’s it. Not long after, I lost my mother when she had to give me away. The shock was so intense that I lost everything that happened before then — even my language. Musunka’s story reads like a film script. She was born in Lubumbashi in what is now the Democratic Republic of Congo (DRC), sent to live with relatives after her father died and scouted as a model in London while studying for a degree in business management. Then she embarked on an international modelling career. 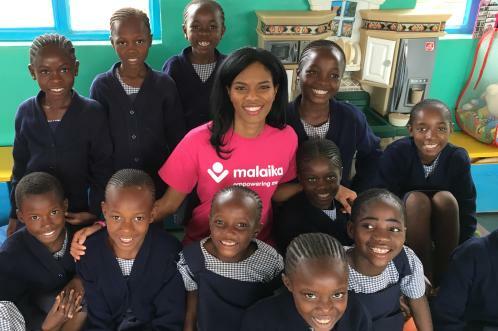 This became a platform to launch her non-profit organisation, Malaika, which empowers Congolese girls through education. Its projects include a school for 280 girls, a community centre and nine wells in Kalebuka, near Lubumbashi, and there are plans for a clinic. It has established its founder as one of the leading voices in education for girls in Africa and an ambassador for the Global Fund to Fight Aids, Tuberculosis and Malaria. Aged five, Musunka boarded a plane alone. She spent her childhood being shuttled between relatives, first in Belgium, then in Switzerland. “When I say I was educated in Switzerland, people think of boarding schools and rich families. It was not like that at all,” she says. Musunka was brought over to work as a maid and cleaner. There was no email, and over the course of 13 years she spoke to her mother on the phone only two or three times and they exchanged just a few letters. There were no presents at Christmas and no one celebrated her birthday. Musunka took a break from modelling “to give my children what I didn’t have”. This didn’t mean taking a break from her “third child”, Malaika. From the beginning her name was on every paper and every email concerning the organisation. Nothing escapes her notice, she says, from every dollar spent to the absence of a single pupil. She wakes early to liaise with people in the DRC and logs back on after her children’s bedtime to speak to New York, where the charity is based. Between her early and late calls her phone lights up with Whatsapp messages — on the day we meet, she receives photos of pupils having a dressing-up day. “If you are lucky enough to have a voice you should use it,” she says. She gives short shrift to celebrities who come to the DRC for photo opportunities, but she’s full of praise for her team, all but one of whom are volunteers, and for the rapper Eve, who said she wanted to help and promptly booked a flight to the DRC, and her fellow Global Fund ambassador, the actress Charlize Theron. Plus, there was no electricity, no water and no road. Musunka lobbied for electricity for the region and, with the help of the Voss Foundation, the philanthropic arm of the bottled water company, built a well. Hundreds of people came to collect clean water every day, so they built another well. Every solution they came up with exposed another problem. In the DRC life expectancy hovers around 36. One of the school’s pupils died from malaria during a Christmas break. When another girl was absent from school, her teacher went to visit her at home to find her in a critical condition after being run over by a motorbike. Her parents couldn’t afford medical treatment, so Malaika paid. After another bout of building work there will be 340 pupils at the school. Girls can enter a ballot for a place when they are five if they live within the catchment area. Students are provided with everything from shoes to underwear and two meals a day, in a region where a family would struggle to provide that. Pupils’ health deteriorated during the vacations, so they started holiday camps. The curriculum encompasses everything from the most basic skills, including how to use a toilet (most homes don’t have one), to recycling, IT and yoga. Students achieve record-breaking national exam results. There is also a community centre, built in partnership with football’s governing body, Fifa, offering education, health and sports programmes to the wider community. Fifa was so impressed that it plans to roll out community centres in other areas. Musunka’s focus is widening. This may or may not be related to her seven-year-old son’s insistence that she has “done enough for girls” and should focus on the boys. Musunka marked Malaika’s tenth anniversary last year with a global conference tour. She has since spoken at most conferences bar Davos, which she will “probably” tick off this year. Despite regular speaking invitations she tries to stay at home, strategising in between the school runs, homework and cooking dinner. For the moment that means writing a manual of operation for Malaika, her “gift” to those keen to know the secrets of the project’s success (there’s talk of similar institutions in Kenya and Liberia).